In preparation for my Jan 24th Indie Birth webinar--Is vaginal breech birth safe?--I wanted to share this series of graphics I have created. These will be explained in more detail during the presentation. 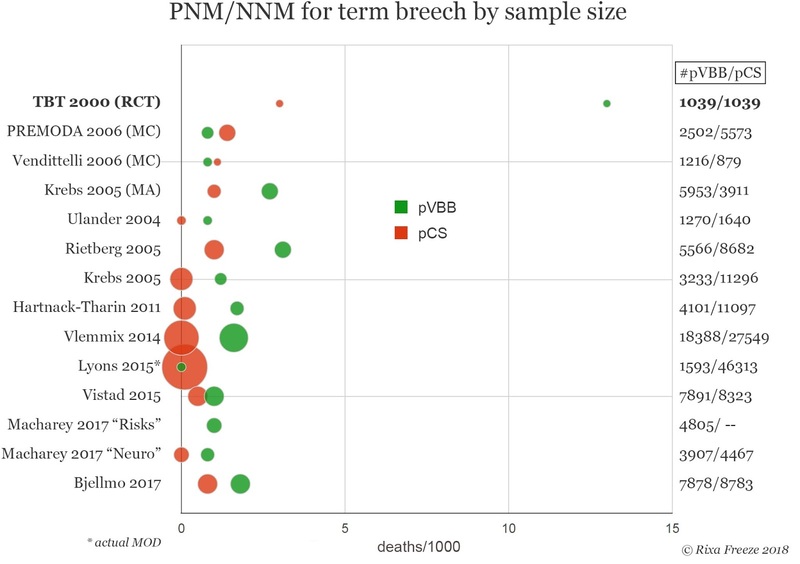 This first illustration shows neonatal and/or perinatal mortality rates from the Term Breech Trial, two large multi-center studies in France & Belgium (PREMODA and Vendittelli), a meta-analysis of several single-center studies (Krebs), and then a series of national registry studies. 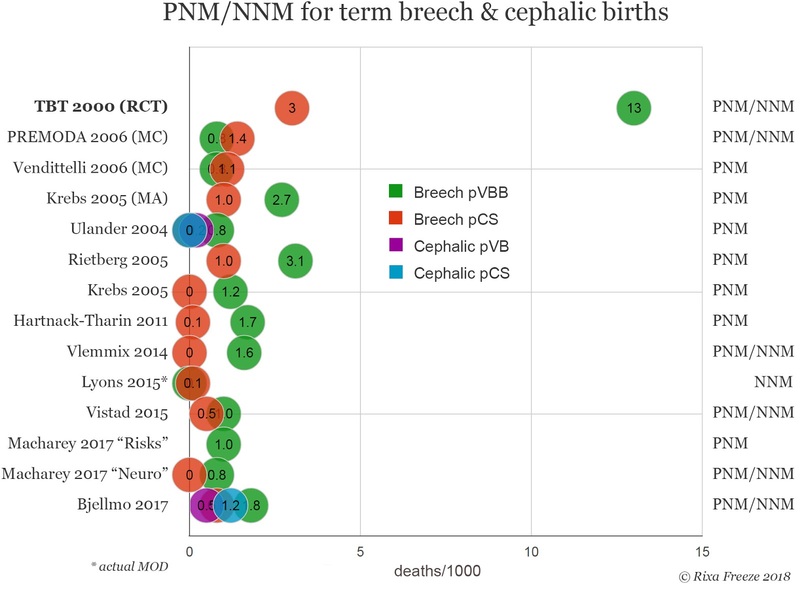 These are all studies of term breech births of singleton fetuses alive at the beginning of labor with congenital anomalies excluded (exception: the TBT also included antepartum stillbirths). For Vlemmix, Vistad, Hartnack-Tharin, and Vistad, I included only the data from the later time periods (usually post-TBT). 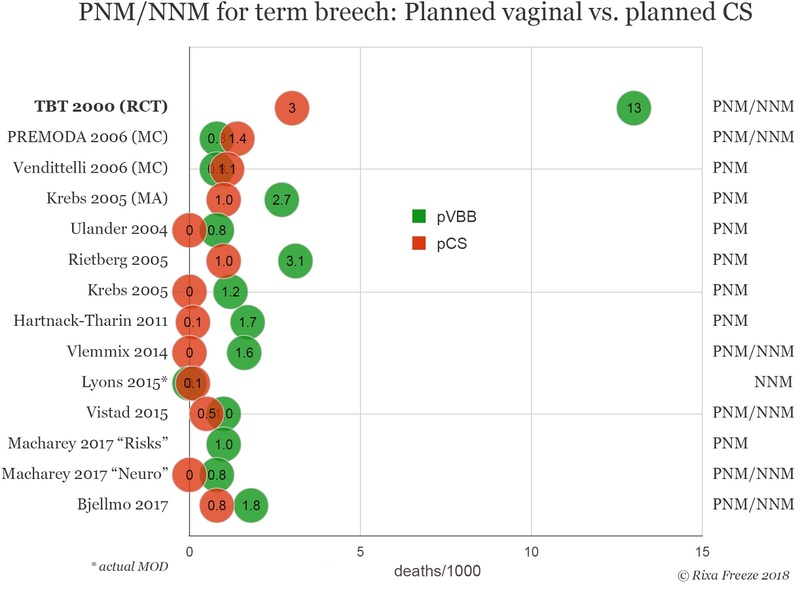 The next slide shows the same dataset, adding in planned cephalic births (vaginal & cesarean) analyzed in two of the registry studies. The last slide shows the relative samples sizes of the various studies. On the right side, you can see the sample sizes of the pVBB and pCS groups.